Mothers or lets say busy moms are one of the real hero’s of daily life. They are actually playing one of the most important role in our life by maintaining their jobs, household chores, family, and to socialize with everyone. Motherhood confers upon a women the responsibility of raising child. This process changes the way in which she is perceived in society and her work place. Many times women also risk their jobs for her family and her kids. Significant changes are seen during each and every stage of a women. Significant social and personal adjustments are necessary to cope with such a situation. Working mother develops the ability of raising a useful member of society and at the same time gains financial independence. Working mother need to balance her home and work. Along with motherhood, work adds completeness of being a woman. Moms are in need of support and guidance to use their time more effectively. Women with children are constantly multi tasking, managing their household, attending to their children’s activities, shopping groceries, and running errands to get their essential items for their spouse and children to ensure their families lives are functioning. Busy moms need to create windows to nurture themselves. For maintaining their hectic schedule in an energized manner, women need to stay fit and healthy. Women, need to include regular exercise in their daily schedule. Exercise helps women to boost their self confidence. Exercising on regular basis gives women a sense of accomplishment which helps in your personality development internally as well as externally, it also helps in self-motivation and self esteem. By getting involved with exercises or workouts stay more longer in this world as compared to others who do not stay active at all. Regular exercises are essential for women because it lessen work pressures and emotional disorders by giving a sense of control. Exercise or workout should be done regularly as it’s a means of physical rehabilitation. Children always seek inspiration from their parents. And parents who maintain healthy lifestyle and routines like exercise and balance diet often have kids grow up to do the same. Exercise will keep your body flexible and it goes hand in hand. Yoga and deep stretching exercises are some of the best ways to increase flexibility. So go for it! The transition to parenthood gradually declines the scope of physical activity. Working parents or working ladies are at the risk of inactivity which is extremely harmful and can lead to depression, mental stress, sleeping disorder, frustration etc. Family barriers are the one of the major barriers according to them. Many parents feel that it is difficult to prioritize physical activity after having children. There are lots of excuses you can give! But instead of giving excuses just get involved in any form of physical activity. Parents or working women can take initiative to stay fit by getting involved with children or during their children activities. Playing outdoor activities with kids would be fun with fitness. Both mother and father can set a good example for their children by giving priority to physical activities. So dear working moms and dads! Get set go! Instead of sitting on couch and munching delicious fried but extremely harmful foods in front of your television. Prioritizing physical activity was also a facilitator that helped working mom and dad to stay active. Once you start to do it your carving for fit and healthy body will increase day by day. After that they would automatically find ways to keep themselves fit by indulging in some exercise or workout. Working parents cannot spend hours in gymming, instead they would start with 15 to 20 minute workout, exercising in small chunks will help you avoid burnout and it will also keep you motivated all day. One more thing if you want your children to know the value of fitness exercise with them. You can go on walk with your kids, instead spending your “valuable evening” on the couch or sofa! During your physical activity you can also talk to your children and tell the importance of working out daily, it just doing something with is more valuable and worthy for your kids in future. No one get into shape or fit overnight. No one can motivate you, set some goal to achieve and self motivation will come automatically from within. Start from small, and have patience. Because having potato chips or drinks sitting on your couch wouldn’t help you, same values will be instilled in your children too! As parental traits pass on! Try to lead a disciplined life and your children will follow the same. Dear busy ladies! Regular exercise is better than a nap boosting your energy levels. Don’t skip breakfast ever! Breakfast should be healthy and full of nutrients. Say yes to self nurturing. One of the most important part of self nurturing or self caring is having realistic expectations. “Feel free to alternate between now and the future as much as it feels helpful, without giving yourself a hard time for needing a break from today.” Materialistic life or material aspirations and basic necessities of daily life compel both of the parents to work. Today women insist to maintain an effective career and to be financially independent. 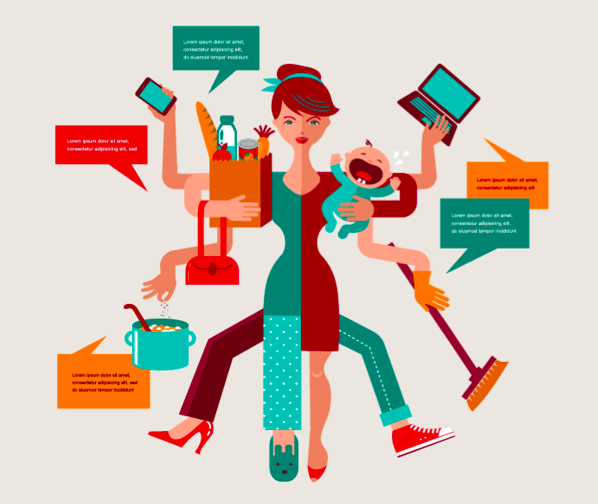 Stress loads are high amongst the working women or you can say busy moms! And it can be often reflected in their relationships at home. Woman is stressed to reach her work place on time, she is stressed to send her child to school, and to reach all the children’s deadlines on time including food and dress, and she is also pressed for time to look after her home simultaneously. There often is need to use and avail of unpaid leave and unexpected absences from work. 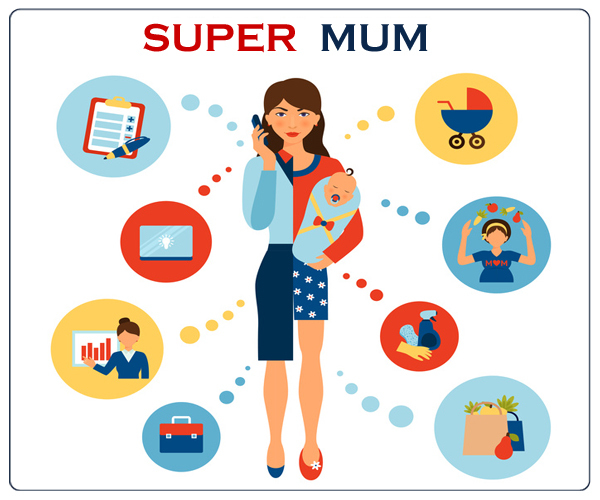 The working mother has to keep the convincing stance that she is working not just for her own sustenance, but also for the betterment of the family. Squats – it can done within 10 minutes and it is quite beneficial too! Squats build muscles all over the body. It helps in increasing muscle mass and strength all over the body. Squats are extremely helpful in burning more fats . More muscles burns more fats. It maintains more balance, Not only will squats put on appreciable amounts of size and strength on your legs. Squats actually help contract the core, namely the abdominal area, effectively and efficiently. Squats strengthen joints and prevent injury. Squats don’t require an expensive machine or apparatus to be performed. It can be done anywhere, its actually quite flexible for working woman! it doesn’t need any gymnasium membership. Step ups – Step ups are excellent exercise for weight loss at home. It strengthens muscles of legs, knees and hip. Step ups play major role in loosing fat and reducing body size. Step ups can be done anywhere be it work place of home or shopping malls! All you need to do is to take stairs instead of elevators and lifts. It increases heart beat and pumps more blood. Step up exercise is equivalent to running or jogging. But still they have their own importance and benefits. Step-ups increase your heartbeat, as they make you move your body at a fast pace. When the heart beats faster, you are pumping more blood so as to meet the requirements of the legs and other body parts involved in fast movement. This causes the body to use its fat deposits. Due to this, you lose fat, as well as reducing body size. So, the main benefit of the step-up is weight loss. Push ups – Initially it would be little tough but as you will start doing it slowly, your carving for doing push ups will increase automatically. It improves flexibility, prevents from injuries as it will strengthen your muscle. The movements of a push up, you recruit a wide array of primary and stabilizing muscles. Normally when people are tired they prefer to sit according to their comfort which can lead to improper posture. One of the most common reasons for a lack of proper posture is weak core muscles. It prevents lower back injury, which are mostly seen among women who are not able to give time for physical activity. Push ups can be done at home only whenever you get time. Thankfully, you don’t need an expensive gym membership – or even any equipment – to obtain an effective and thorough full body workout. It reduces the chances of osteoporosis’ or any other bone diseases. It helps to cultivate strong body. Lunges – Lunges can be performed any where. It creates better balance of the body, it increases flexibility in the body muscles, it helps to tone all the leg muscles. It is not important to do only advance level lunges one can also do start up level lunges. It also benefits our hip muscles. Lunges can improve core strength. It simply involve lunging forward on one foot as if you are taking one large step. Lunges target many muscles in your abs, thighs and hips. Lunges not only strengthen your muscles but it also stretch them which makes it flexible. Crunches – one of the most important exercise for abs. It is one of the best abdominal exercise. It develops internal corset and with the help of it we can stabilize our spine. Having strong abdominal wall is very important for the body movement and gets increasingly more important with advancing age. This exercise must be done in variety of positions and angels. Front plank – It is one of the easiest exercise according to me, because we need to remain stationary. And in this stationary position too our abdominal works. Planks are common for injury rehabilitation. The plank exercise helps strengthen upper body and lower body muscles along with the front body. Ladies! Plank exercises play an important role in enhancing appearances. Shoulder stand – I do shoulder stand exercise for 5 minutes only while going to sleep. It can be done by anyone. It lengthens and strengthen spinal nerves. This exercise is must for those who are suffering from thyroid disorders, it regulates the hormone secretion, it increases our energy level if it is practiced daily and most importantly it helps a lot in losing weight. Total body workout – total body workout burns more calorie in less time. Full body movement helps in strengthening whole body. It helps in workout efficiency and increases whole body’s flexibility.